Ashoka Fellow Tom Ravenscroft proves that “soft” skills are as relevant as literacy and math in preparing today’s students for the workforce and beyond. As a new teacher in London, Tom Ravenscroft became increasingly alarmed at the gap between what his students were learning and the skills required for a 21st century workforce. He designed a modern curriculum at his kitchen table and eventually launched Enabling Enterprise, an organization that proves “soft” skills are as relevant as literacy and math in preparing today’s students for the workforce and beyond. Tom founded Enabling Enterprise to tackle the urgent skills gap between typical education and the world of work, as well as the false perception that ‘soft’ skills—communication, listening, and empathy, for example—are immeasurable and a lower priority than traditional education. He developed a methodology and a shared language to demonstrate that enterprise skills are not only essential for success in many areas of life, but also teachable and—importantly—measurable. Enabling Enterprise believes these 8 skills are crucial to prepare children for the real world. Enterprise education has largely remained at the periphery of mainstream education, with lessons on entrepreneurship and work experience relegated to extracurricular programs, if at all. As a new teacher, Tom quickly realized that a typical school’s core curriculum was not sufficient to best position a student for future success; he knew he would need a framework and a shared set of metrics for stakeholders (schools, teachers, students, and employers) to recognize the full value of including enterprise skills in core classes. Tom developed a curriculum around eight skills: creativity and problem solving; ambition and positivity; listening and understanding; and teamwork and leadership. He also challenged the perception that these skills should only be taught to those going into business, rather than as a set of transferable skills for all. Enabling Enterprise works with primary and secondary schools across the U.K.—the majority in under-resourced neighborhoods—impacting young people, ages five to 18. Throughout the school year, students are taught enterprise skills in dedicated lessons. Trained teachers embed these skills and their underlying values across all subjects. Students participate in experiential learning by setting up their own ventures and visiting real businesses. In 2017, this unique curriculum reached 87,000 students in over 250 schools. Tom wants to double Enabling Enterprise’s reach over the next two years while influencing the wider system to ensure that all young people leave school equipped with enterprise skills, exposure to the world of work, and the aspiration to succeed in life. 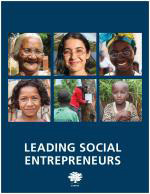 Tom' s story appears in the 2018 edition of "Leading Social Entrepreneurs" which features a selection of just a few of the Ashoka Fellows recently brought into the largest global network of social entrepreneurs. The LSE presents some of the newest innovations by leading social entrepreneurs whose ideas are changing the way things are done all over the world.